CRM workflows can be used to do simple calculations. I have come across many users who are not aware of this feature and thought it would be a good topic for a blog. In this example, the workflow is doing a simple calculation. 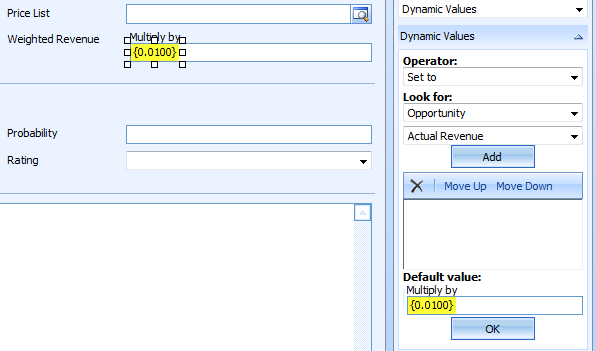 Before you build this workflow, add an attribute called Weighted Revenue of type money to the opportunity form. 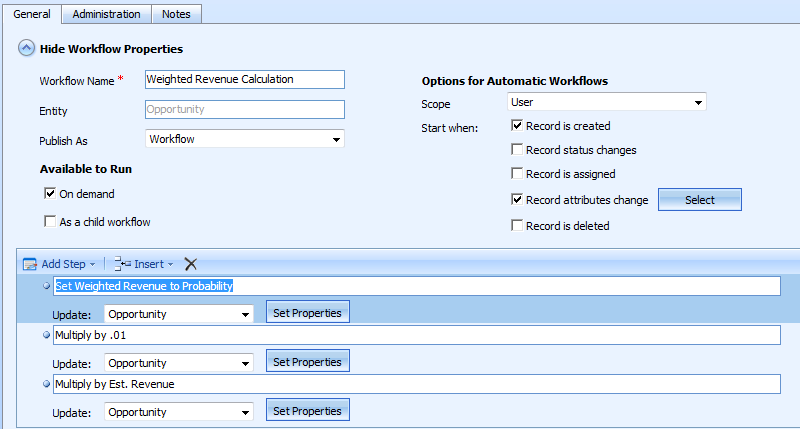 Now Create a workflow that calculates the weighted revenue value from Est. Revenue and Probability. In CRM we capture probability as a whole number so Weighted Revenue = Est. Revenue * (Probability*0.01). <Editor note> This is so simple and an awesome way of calculating the weighted revenue. I absolutely love this. For the kicks, we actually tried this out and it took us just 4 minutes to implement this solution. We're always looking for feedback and would like to hear from you. Please head to the Dynamics 365 Community to start a discussion, ask questions, and tell us what you think!